Last Sunday Neil and I woke early to glorious sunshine and decided it was definitely a day to be spent outside. 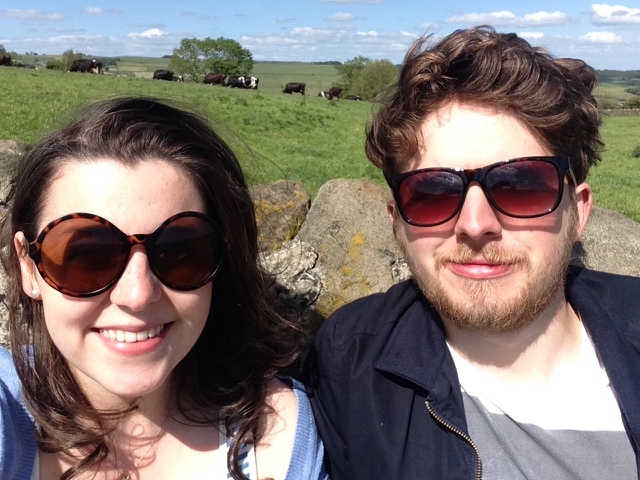 It just so happened to be 'Open Farm Sunday' an event in which many farms all over the UK take part, opening up their cow sheds, chicken coops and pigsties to give the general public a hands on experience of life on a farm. We checked out what farms in our area were participating and decided to spend the day at the Our Cow Molly farm; a place I'd been meaning to visit for a long time. Famous for their ice-cream but also a huge milk supplier to shops of Sheffield 'Our Cow Molly' is a success story of the farming industry whose goal is to supply every shop in Sheffield with fresh milk. Whilst other dairies in the area have been forced to closed due to a constant loss of money, 'Our Cow Molly' stood out from the crown creating a brand which is now a well known and loved in Sheffield. We had a little wander round the farm, before queuing for a tour of the Milk Dairy, unfortunately we'd missed the ice-cream parlor tour earlier in the day, but never the less got to see inside the dairy and learnt some surprising facts about the difference between supermarket milk and the milk produced at 'Our Cow Molly'. A very shiny dairy indeed, its strange to think that such a clean place exists on a farm it was a bit like stepping into a science lab. Our tour guide Dan gave us a run down of the process pointing out which machines did what, and how they create cream, skimmed and whole milk and a new venture into butter. Did you know that supermarket milk doesn't hit the shelf until 6-7 days after being milked from the cow? Well at 'Our Cow Molly' their milk goes from cow to Sheffield shelves in under 24 hours, how fresh is that? After the tour we decided to try out the ice-cream which was very popular with everyone there, the queue was massive! 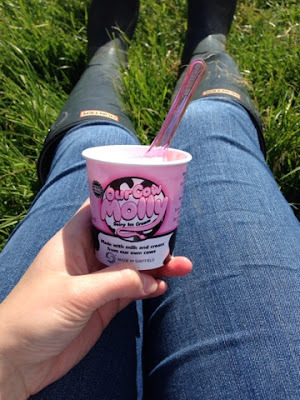 Well what better way to enjoy your ice-cream than sat in the field right next to the cows that produce it? We sat for a while just enjoying the sunshine then headed home, but not before purchasing some milk and some of their second batch of butter they're currently testing out (foodie blog post on the way for that). 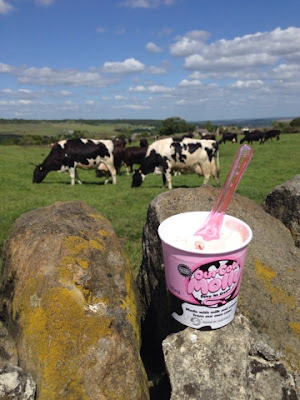 If you're ever in Sheffield you should take a trip up to the 'Our Cow Molly' farm for an ice-cream, or you could pick up a bottle of their milk to try in the city center, you won't believe the difference in taste! !